Since the implementation of 10% imports duty on populated PCB in April 2018, in a stride to boost CKD level manufacturing of mobile handsets in India, the Indian rupee has seen 10.2% decline in exchange value as against the US dollar. As per techARC estimates, even after the CKD level manufacturing, the domestic value addition is in the range of 15-20% depending on the mobile handset category and the manufacturing capabilities of the handset OEM. This means handset industry is still dependent on imports of components amounting to 80-85% of the BOM of a handset. 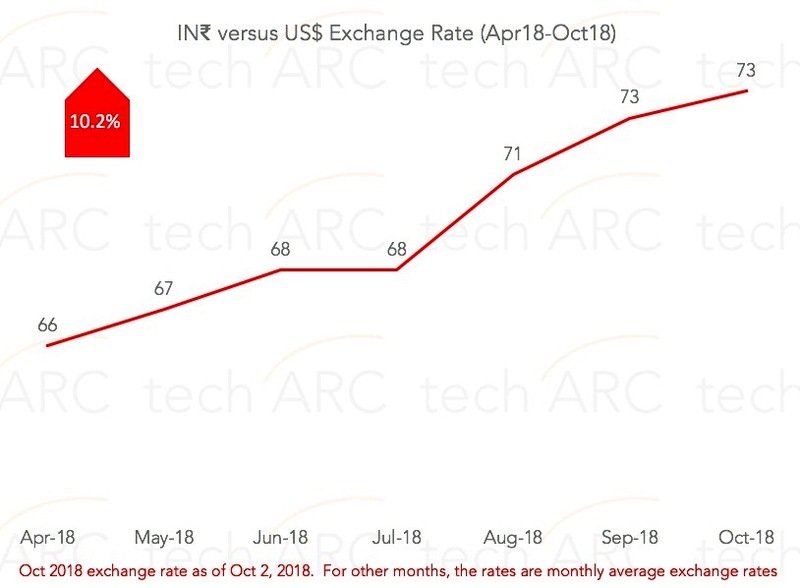 Since the increase of US$ against IN₹, especially after April 2018, the net monetary advantage that an OEM was earning by manufacturing in India has offset against the declining rupee value. In fact, there is a negative equation by 2-5%, where OEMs are procuring components at average 10.2% increased price and only getting 5-8% monetary advantage of manufacturing in India even at the CKD level. The OEMs are ‘tight fisted’ and cannot increase the price of handsets due to hyper-competitive market scene. On the contrary, the market pressure continues to act on the average selling prices, where there is a direct correlation between the age of the model and the selling price. As an outcome to this market condition, it is being observed that many handset makers are fast forwarding their launches and there were launches even in otherwise ‘dry’ periods like August. The industry launches Smartphones either in May-June or Sep-Oct periods to prepare for two peak cycling trends in the sales - resultant of new university sessions (when youth join colleges and universities) and the festive season, where masses take advantage of the offers and discounts to buy a new Smartphone. Also, some of the new comers launched their next Smartphone within a quarter or less of their first launch, which used to be a gap of 6 months. This trend is not only hurting the prospects of Making in India. The OEMs can decide to go low on the local production and import devices in completely built form to get a price correction window and manage profitability. This would take the prices of the mobile handsets upward, but then brands will be swift to respond to the rising dollar price. However, this is not the intent of the industry as they have seriously committed to Make in India and made investments in hundreds of crores to make manufacturing of mobiles in India a success. The other alternative with OEMs is to ‘kill’ models very quickly and absorb the price hikes in subsequent launches. But, this would mean launches being driven by procurement and pricing rather than real value add for a consumer. This option would let consumers see handsets being made available frequently in the market by OEMs but without much of improvisations or addition to features. The just noticeable difference or what is known as JND, would be at its low. In such market conditions, players like OnePlus whose genesis is to substantially enhance the experience of users with every launch; thus, keeping the number of launches limited to 1-2 models in a calendar year have to intelligently maneuver through without hurting the profitability. For other brands, it would be relatively easy to veil the price rise in components due to falling rupee value in the currency exchange markets.